Local Galapagos experts based in Quito will help you plan the ideal trip to Galapagos, the Ecuadorian Andes, The Amazon, or Peru. World Class, Personal Service. We help you from the moment you first contact us throughout your entire journey until you arrive back home. 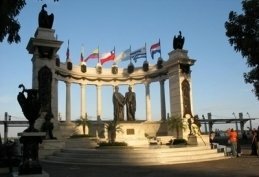 You will be greeted at the airport by an English speaking guide when you arrive in Ecuador and be accompanied by knowledgeable professionals every step along your voyage. Expect gratuitous Ecuadorian hospitality backed by the management’s attention to detail and highest standards of quality. Expert Advice. 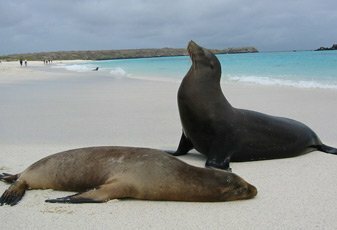 We ONLY offer Galapagos cruises, tours, and extensions to Peru and Ecuador. All of our Galapagos Trip Planners live in Ecuador, have traveled to the Galapagos extensively, and know each of the boats, hotels, and islands intimately. A generalist travel agency can never have this depth of knowledge. The Best Value. As one of the world’s leading tour operators for the Galapagos Islands, and by being located in Quito, we negotiate the absolute best rates with every boat and hotel. We pass those savings on to you. Low prices combined with top-tier service equals a better value than you’ll find anywhere else. Join the thousands of satisfied travelers who have experienced traveling to the Galapagos with Columbus Travel since 1997. Contact a Galapagos Trip Planner today to start planning a trip designed for your precise personal interests, travel style, and budget. 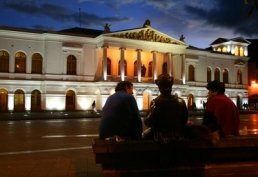 Our day-tours in Ecuador include city tours of Quito, Cuenca, and Guayaquil, “Hop-on, hop-off” routes through Ecuador’s main cities, and day-trips to the Otavalo Indigenous Market, Papallacta, and more. 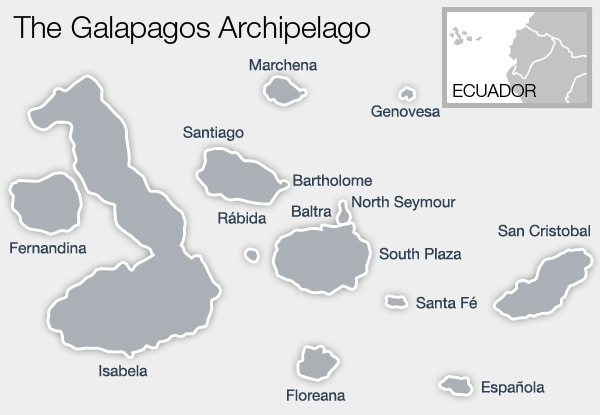 Galapagos cruise itineraries last from four to fifteen days and always start and begin from the Ecuadorian mainland. Onboard, one will travel from island to island on a small yacht or cruise ship carrying up to 100 passengers and visit one or two National Park visitor spots each day. We offer cruises on over 60 different yachts. Please contact a Galapagos Trip Planner to help you select the best yacht for you. Some 600 miles off the Pacific Coast of Ecuador lays a cluster of volcanically formed islands. They were made famous in the 19th century by Charles Darwin as they helped inspire his theories of evolution. Today, this archipelago is one of the world’s last “Edens,” where animals have no fear of humans and continue to live just like they have for millennia. Experience the lively people, colors, festivals, centuries-old indigenous markets, and landscapes that look like quilted green patchwork etched into the beautiful mountainsides. 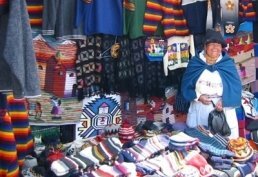 Learn about the rich Andean culture that spreads over all of Peru. 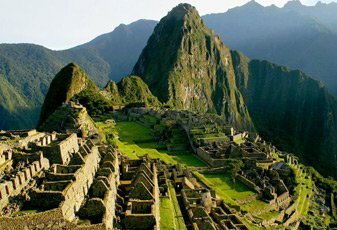 Journey into ancient ruins left behind by the magnificent Incas, and see why they decided to make their home in the Andes. The Ecuadorian section of the Amazon Rainforest is one of the most biodiverse regions in the entire world, and most parts of the Ecuadorian Amazon are surprisingly accessible by a short flight from Quito to Coca or Lago Agrio, followed by a canoe ride down one of the tributaries of the Amazon like the Aguarico or the mighty Napo River. Choose from the best ecologically friendly lodges located deep in the rainforest that accommodate a range of budgets — from basic to luxurious — and cater to all types of travelers. 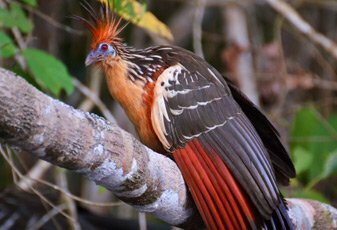 Or, climb aboard a riverboat, and drift down the tributaries of the Amazon River spotting Amazonian wildlife like monkeys, sloths, and hundreds of species of birds like the prehistoric looking Hoatzin. 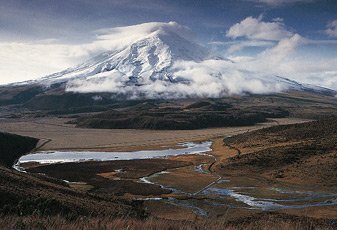 Explore the different regions of mainland Ecuador on a tour to the magical landscapes and colonial cities of the Andes Mountains, and to the beautiful beaches of the Pacific Coast. 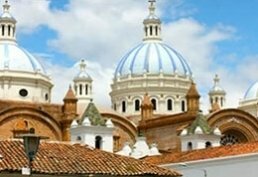 Choose from a variety of Quito or Guayaquil city tours, or venture beyond the city to visit the world famous Otavalo Indigenous Market, Papallacta Hot Springs, the Mindo Cloudforest, the adventure travel capital of Baños, or the charming colonial city of Cuenca. 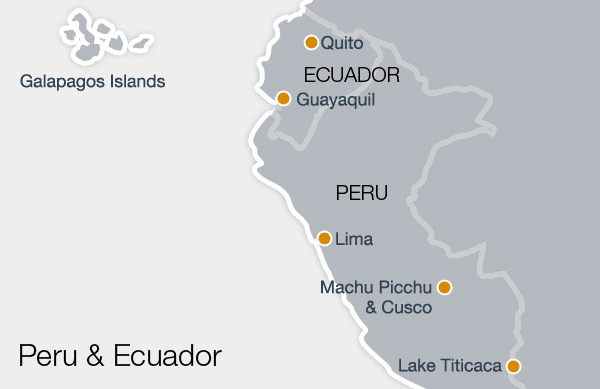 Get ready for an incredible expedition through the Ecuadorean Andes and the Pacific Coast. These novel tours offer unparalleled cultural immersion and the possibility to learn more about the customs and traditions of Ecuador. 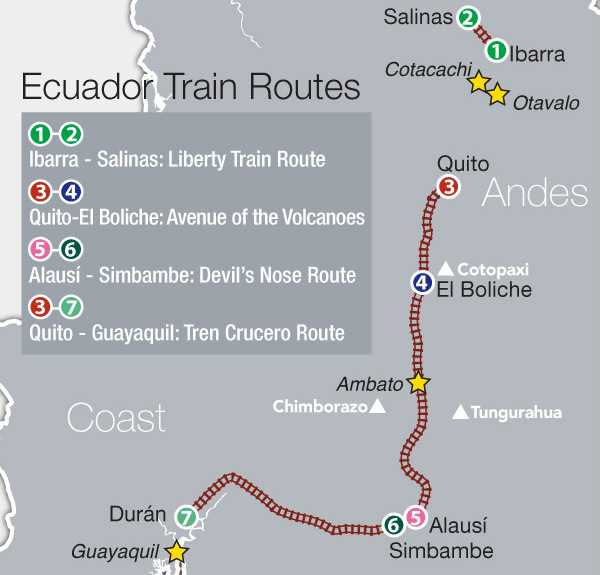 Columbus Travel is proud to present the latest train travel packages including rides to the Northern Andes and its diverse blend of cultures: witness the Avenue of the Volcanoes, featuring Cotopaxi National Park and a comprehensive journey departing from Quito to the coastal plains aboard the Tren Crucero.